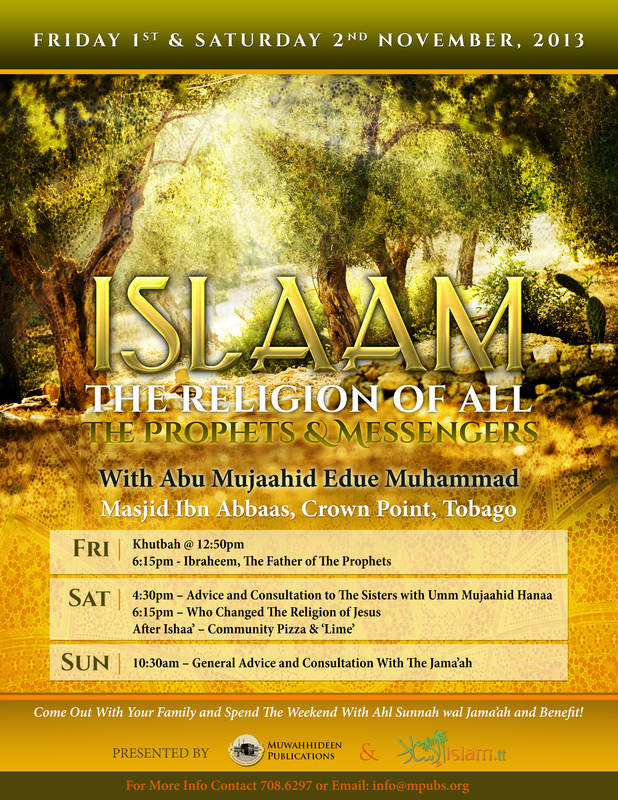 Muwahhideen Publications and Islam.tt in conjunction with Masjid Ibn ‘Abbaas, Tobago are pleased to present a weekend lecture event with our brother Abu Mujaahid Edue Muhammad entitled, “Islaam, The Religion of All the Prophets and Messengers”, which commences on Friday 1st November 2013. Our brother Edue Muhammad studied in Egypt with Ash-Shaykh al-Waalid Hasan ibn 'AbdulWahhab al-Banna (hafidhahullah) and read several books to the Shaykh. He also studied with Shaykh 'Adil as-Sayyid and Shaykh Taamir Fatooh (May Allah preserve them both).